Cabrera’s vole is the only endemic rodent in the Iberian Peninsula. These medium size voles can reach up to 18cm, have long and rough hair, which is brown-yellowish on the back and lighter in the abdomen. The head is large and the snout is rounded with little eyes, the ears and tail are short. 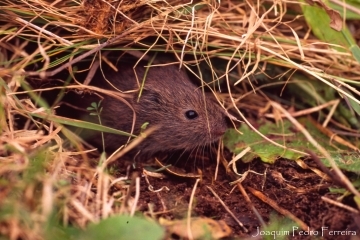 The weight of Cabrera’s vole varies between 43 and 78g. It is an apparently monogamous species, with a social system of stable sexual partners. The reproductive activity happens during the times of the year with more rainfall. Each female can give birth to a litter of 3 to 8 offspring, twice to four times a year. It feeds mainly on grasses (Gramineae). It occurs in pastures, fields and open clearings in woodland, tending to prefer damper areas than the common vole. It is often found in proximity to water (Palomo 1999) and on road verges (Santos et al. 2006, Pita et al. 2006). Meadows and perennial grassland communities are the most favourable microhabitats for this species (Santos et al. 2005). It lives in colonies in tall grass areas (feeding zones), with high soil moisture, and close to heaths or disperse thickets (protection zones). Its distribution is highly fragmented and includes the southwest and central Iberian Peninsula. In Portugal it is found in the southwest, central and northwest regions, being more frequent in the coastal and central regions of Alentejo, Ribatejo, Beira Interior and International River Douro. The main threat factors are habitat change and destruction, direct consequences of intensified farming practices and grazing. It is an Iberian endemism, listed in Annex II of the Habitats Directive, globally classified as Near Endangered (Fernandes et al., 2008) and is considered Vulnerable in Portugal (Cabral et al., 2005) and Rare in Spain (Palomo et al. .
Presents the conservation status of "Vulnerable" in the Vertebrates Red Book of Portugal.